Tis the season to be merry and I’m getting ready and working on my festive gift guides. 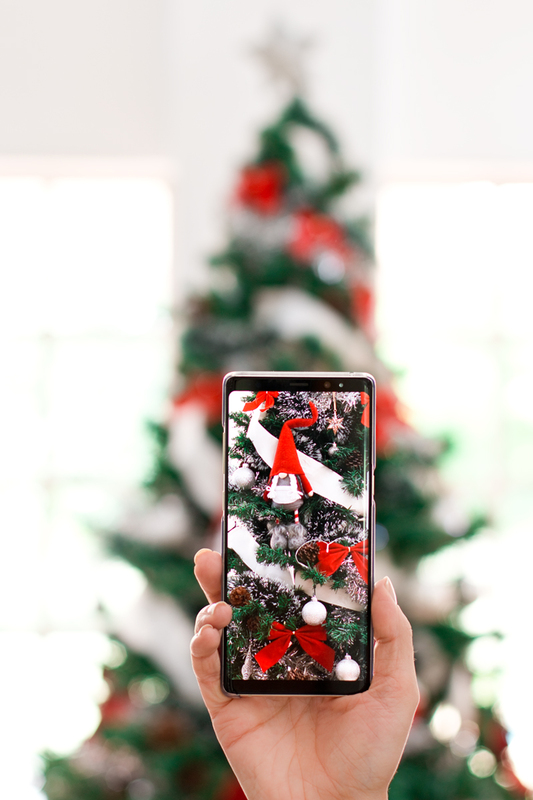 But first, let’s talk about the most festive of all, your Christmas Tree! I love putting up my tree and I love decorating it, so today I thought I’d kick off the StyleScoop Holiday Season with some ideas to create the perfect festive cheer in your home. This pic was taken two seasons ago, when I decided to lose the OTT Christmas sparkle and create a tree that I loved to look at. Last year’s one (in the next pic) was pretty much the same, except I added in some more greenery and switched up the layout of my little bows. This year, I plan to stick to a very similar style. I just wish I could get a taller tree, but there is nothing wrong with mine, so wondering if it’s actually worth the extra money spent! Anyway, we’re talking about decor today, so let’s get stick to that! I get that the holidays are all about sparkle and shine. And sparkle and shine you should! But when it comes to decorating your tree, I do think that there is such as thing as overkill. In the past, when I used to go full psycho on decorating my tree with shiny-shiny things, I used to get very bored of it very quickly. I couldn’t wait until December 26th to pull it down and pack it away! So now, I prefer to style up my tree a little differently. Keeping it festive and fun, but also pretty to look at! A ribbon, tied to the top of your tree and draped around it adds so much elegance and once you try it, you will want to keep this trend going. The trick is to find a ribbon that matches the style of tree you’re going for, but I also like to choose a ribbon based on my current home decor scheme, so that the tree looks like it belongs. I chose white for my tree, but I’d love to find a black and white striped ribbon for it this year. When choosing your ribbon, also be sure to look for one that is pretty wide. I’d say anything that’s 60mm wider or more would be ideal and the best place to find these kinds of ribbons is at fabric stores and haberdasheries. I tend to use very little tinsel on my tree – especially the shiny-shiny kind. But, I know it’s the tinsel that makes your tree look fuller and overall more lush, but there is another way to achieve this! After I put up my tree, I drape green tinsel (the kind that looks like the tree) around and instantly, my tree is fuller! I also stocked up on some Dark Green Tinsel with White Tips which again adds fullness without overkill. TIP: If you’ve got lots of shiny-shiny tinsel and it gets to you, don’t throw it away! Just grab some white spray-paint and paint over it. Don’t paint the whole thing – unless that’s your vibe – but I found spraying it with some plain white paint tones it down a whole lot, but keeps a bit of shine here and there. Okay, so lights are an absolute necessity when you put up a Christmas Tree – am I right? I used to always have to find a spot for my tree where there was power. That, or have a hideous extension cable peeking out. But, now with LED and Solar lights, you can light up your tree to your heart’s desire, place your tree anywhere you want and also limit the risk of electrical fires. I found fantastic Silver Wire Lights with 100 LED battery operated lights from Westpack which I think was like R150 or so. I also found another type of LED lights, again battery operated, but with a controller to change up the way you want your lights to work: flashing, flickering, steady on, dull to light etc. They are great and you can choose if you want warm white, cool white or colouful lights or maybe all three! I use very little hanging baubles on my tree. I probably have maybe 12 or 15 in total and every season, I like to add one or two really special ones to my tree. Not just anything you buy from the supermarket – something special! I guess it started when my Aunt sent me a beautiful Holiday Swarovski bauble from the US a few years back, and it has been my goal to collect these and eventually have only a Swarovski embellished tree. Let’s just say, I still only have the one, but a girl can dream can’t she? Then, there’s the case of baubles with a purpose! I’ve had this idea for a while, so this year might be the year I try it haha! So, I was thinking it would be pretty awesome to lose the ornament baubles on my tree all together and instead have baubles with a purpose. Two birds, one stone! I could decorate my tree, then on Christmas day, invite family and friends to eat or pick off the tree and then no having to pack up (or collect) ornaments after the holiday season. Pretty cool hey?! I just don’t know how the chocolate ones will look since our Christmas season is always so hot. ZARA HOME has the cutest, and I mean cutest selection of Christmas Gnomes, and it looks like they keep them coming. I bought one last year for my Christmas Tree, but now I’m obsessed! I think they are so cute to have around the house for the holidays and they look so cute on the tree too! I love cute and stylish Christmas stockings and this year I’m going to make these fabric stockings mine! I love how these designs from local loves, Zana look festive without looking too kitch. Also, the black and white designs go so perfectly with my home decor! Okay, I think I’m about ready to pull the tree out of storage and get cracking on getting my decor up! Have you put your tree up already? When do you usually start and also let me know what kind of decor you like to incorporate into your festive season.